One bizarre idea that pops up from time to time in fiction and conspiracy theory is that of the hollow Earth. There are several variations on this, including that there’s a smaller sphere or multiple spheres inside the larger sphere on the outside of the planet and that there’s a world on the inside surface of the crust. The concept owes something to ancient depictions of the underworld, usually regarded as the world of the dead. In Dante’s Divine Comedy, the different levels of Hell are concentric spheres, with Satan encased in ice in the very center. Other spheres surround the Earth, and are where the other planets are located. Dante probably wasn’t being literal when he represented Hell and Heaven this way, but I get the impression that he inspired later Hollow Earthers. Several civilizations had origin stories that involved their ancestors having emerged from an underground world, and Tibetan Buddhists have the legend of the peaceful and mystical underground city of Shambhala. It appears that the more modern Hollow Earth Theory first gained popularity in the nineteenth century, when the army officer John Cleves Symmes lectured on the idea of worlds inside the Earth accessible by way of the North and South Poles. It’s rumored that he actually interested President John Quincy Adams in an expedition to the polar opening, but Andrew Jackson killed the project upon taking office. If only Cleves could have convinced him that there were minorities living down there whose land he could take. 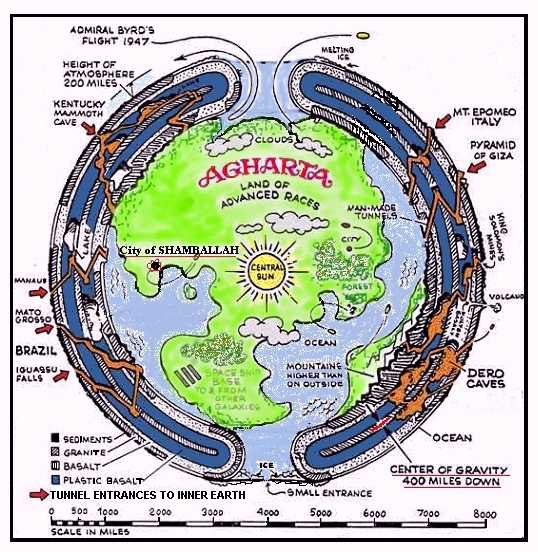 Occultist Alexandre Saint-Yves d’Alveydre wrote about Agartha, a city located at the center of the Earth, probably partially based on Shambhala. The Nazis also tended to be rather fond of the idea, and there’s a belief that Hitler and his followers might have escaped down there. I’d say that would be a good reason to avoid it. Jules Verne’s Journey to the Center of the Earth does not propose a hollow Earth, but does give the planet subterranean caverns large enough to hold entire seas. I have to wonder if it was also the first time an underground world was home to dinosaurs and other animals that are extinct on the surface, which has become a common trope. Edgar Rice Burroughs used it in his Pellucidar novels, which take place on the inside of the Earth, with the core serving as its sun. And I’ve already written about underground lands in the Oz books, many of which seem to take influence from hollow Earth fiction. 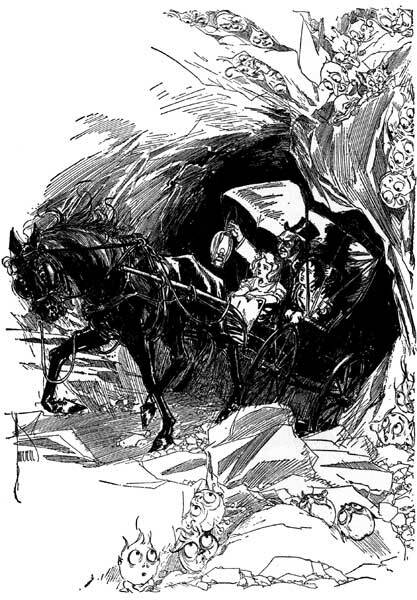 Dorothy and the Wizard in Oz suggested large caverns like Verne’s rather than a hollow world, but Ruth Plumly Thompson’s nine underground kingdoms as mentioned in The Yellow Knight of Oz suggest influence from the theories proposing concentric spheres within the Earth, as well as from Dante. Finally, I feel I should mention Robert Rankin’s The Greatest Show Off Earth, which plays on the Hollow Earth hypothesis by featuring a plot in which WE live inside the Earth, and the inhabitants of the surface are considering plugging up the polar openings in order to stop our pollution from harming their world. It’s certainly an intriguing idea, which is probably why it still lingers despite the fact it flies in the face of everything we know about gravity. This entry was posted in Authors, Buddhism, Conspiracy Theories, L. Frank Baum, Mythology, Oz, Oz Authors, Places, Religion, Robert Rankin, Ruth Plumly Thompson and tagged adolf hitler, agartha, dante alighieri, dinosaurs, divine comedy, dorothy and the wizard in oz, edgar rice burroughs, heaven, hell, hollow earth, john cleves symmes, journey to the center of the earth, jules verne, pellucidar, president andrew jackson, president john quincy adams, satan, shambhala, the greatest show off earth, the yellow knight of oz. Bookmark the permalink. I have never seen this interpretation of Dante before, and even the book your illustration is from, Dorothy L. Sayers’ annotated translation for Penguin, makes it quite clear that Hell is an inverted hollow cone in the Earth, with the point at the center, where Satan is trapped. In fact, it was hollowed out when he fell from Heaven. 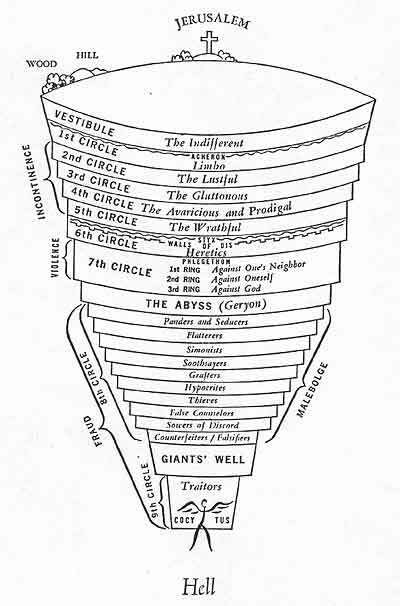 The circles are terraced levels in the cone, and below Satan (or above him, from the viewpoint of the Southern Hemisphere) is a long tunnel that leads to Mount Purgatory, made of all the solid substance that rushed out of Satan’s way as he fell. The spheres surrounding Earth are not Dante’s own idea, but merely standard pre-Copernican astronomy. Okay, I guess I was reaching a bit with that idea, although I’m sure Dante did influence stories of underground worlds, particularly those in layers.